Coach Yourself Thin Author Greg Hottinger, MPH, RD, is accredited by the Academy of Nutrition and Dietetics, worked as a nutrition educator at the Duke University Diet and Fitness Center and the Duke Center for Integrative Medicine. Currently, Greg is a nutrition consultant teaching faculty member for Wellcoaches, the leading coach training organization. Greg raises awareness around eating, activity, & body image. He provides a safe & supportive structure & guidance for creating a wellness vision that WORKS. I see the Silver Sage wrote about dark chocolate . I organized a test taste when I lived in Asheville and it was so much fun. I'm due to do that again. In the meantime, here is my write-up on the taste test- If you grew up in the United States, your image of a chocolate bar is likely the one wrapped in a dark brown label with silver block lettering across the front. While you might prefer a Snicker’s bar, Hershey’s has ruled supreme as the classic American chocolate bar for generations. If you’re a self-admitted chocolate snob, however, or you’ve given chocolate a prominent position in your food pyramid, you may have selected one of the approximately dozen superior tasting brands that are offered at most natural foods stores as your most coveted. So, what makes these premium bars special, and are they truly worth the extra price? To understand what distinguishes one chocolate brand from another requires a better understanding of the ingredients and the process that creates such a divine taste. Chocolate comes from the amazing cacao bean (note: this immature bean is not yet considered a cocoa bean), a product of the cacao tree that grows in equatorial countries like the Dominican Republic, Brazil, Venezuela and the Ivory Coast. While there are several different types of beans, the three main beans are Criollo, Fostero (most common), and Trinitario. Chocolate manufacturers typically blend these different beans, the flavors for which vary significantly depending on how they are processed, including the length of fermentation, roasting, and conching (a grinding process that makes chocolate smoother. Higher quality chocolates are conched for as long as 72 hours whereas large American chocolatiers only conch their beans for 4-6 hours). The fermentation process darkens cacao beans and, along with roasting, evokes the chocolate aroma and flavor that we adore and categorize as cocoa beans. Chocolate liquor, or unsweetened chocolate, is created by roasting and grinding cacao beans. There are two distinct components of ground cacao beans: Cocoa is the ground solids and cocoa butter is the extracted fat. Is a higher chocolate liquor percentage really important? The percentage number on the wrapper of a chocolate bar is the sum of the two (chocolate liquor = cocoa + cocoa butter). Milk chocolate is defined by the FDA as containing a minimum of 10% chocolate liquor and at least 12% total milk ingredients whereas dark chocolate, by law, must contain at least 35% chocolate liquor. Surprisingly, the minimum level in Europe for chocolate is 1% chocolate liquor, necessitating that manufacturers display the percentage prominently on the wrapper. You may never have noticed this percentage before. In fact nowhere on the label does Hershey’s indicate that its milk chocolate contains only 11% chocolate liquor. By comparison, the five premium milk chocolate brands that we tasted in our informal tasting all contained at least 33%. The answer is yes if you’re looking for more real chocolate in your chocolate bar. If you’re interested in the antioxidants and the other potentially beneficial compounds found in this remarkable plant food, then knowing how much actual chocolate you are getting is definitely pertinent. I was initially skeptical about the marketing hype extolling the health benefits of chocolate. Not because I doubt the value of eating the cacao bean (which contains over 600 different compounds) but for the reason that we add several teaspoons of sugar to cocoa to create the kind of chocolate suitable to our palates. That withstanding, a small serving of dark chocolate (110 calories – see label) packs the same level of antioxidants (flavonoids in chocolate) as a 5-ounce glass of wine (125 calories). Pay attention to how much chocolate is consumed in studies showing health benefits (the latest study gave subjects 3.5-ounces of dark chocolate or nearly 600 calories worth). The majority of commercially available dark and milk chocolate products, however, have low flavonoid levels because of “dutching,” a common practice that uses an alkaline compound to reduce bitterness. Premium chocolatiers (see below) use a longer fermentation process without dutching to mellow the chocolate while still preserving the valuable antioxidants. Marketers make the mistake of trying to sell chocolate as a real health food, comparing the antioxidant levels of chocolate to green tea and blueberries. A more accurate portrayal, and one that considers all aspects of nutrition, is that chocolate is an amazing food, emotionally satisfying, and a delicious treat that offers real health benefits IF it has a high cocoa percentage and was processed properly. I had no idea until recently that children are routinely sold into slavery to sustain the cocoa industry, particularly in West Africa where 70% of the world’s cocoa supply is produced. In fact, The U.S. State Department estimates that 15,000 child slaves are used on cocoa farms in the Ivory Coast alone.A bill passed the US House in 2001 requiring chocolate manufacturers to label their chocolate bars “free of slave labor.” Before the bill reached the senate, however, the industry agreed to a voluntary measure – called the Harkin-Engel Protocol - to end forced child labor on cocoa farms by July 1, 2005.As you might guess, without a labeling law to uphold, the cocoa industry has made very little progress on this voluntary measure. Buying chocolate Fair Trade certified is the best way to ensure that your dollar is not contributing to child slavery and poverty. 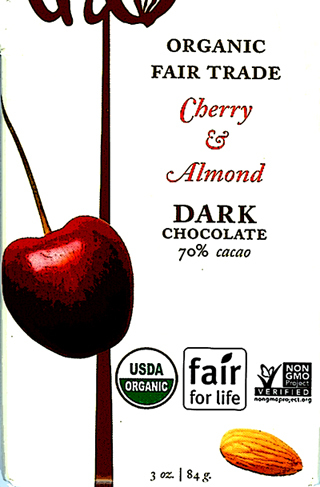 What is promising, however, is that more consumers are buying Fair Trade certified chocolate. Buying chocolate Fair Trade certified is the best way to ensure that your dollar is not contributing to child slavery and poverty. Fair Trade prohibits abusive forms of child labor and guarantees farmers a minimum price for their cocoa harvest. Over 90% of the world’s cocoa production is produced by small farmers, making the Fair Trade cooperatives an ideal program on two conditions: the consumer market for Fair Trade chocolate continues to expand and more farmers understand that producing higher quality beans will command a much higher price. Currently, cocoa farmers receive only a penny for the cocoa contained in a regular candy bar. Since cocoa production is a major threat to the existing rainforest, sustainable practices are increasingly more important. Cacao trees are ideally grown under the shade of the canopy of the existing tropical forests. Most farmers opt for full-sun cocoa production, a choice that produces greater yields but requires more chemicals and destroys the flora and fauna that makes up the tropical forest. Fair Trade cocoa supports the preservation of this canopy, thereby protecting wildlife and nesting birds. In addition, almost 50% of Fair Trade cocoa is grown organically. Organic chocolate sales have skyrocketed in the past couple of years. If you’re wondering, organic cocoa is “slave-free” as farms are subject to an independent monitoring system that prohibits abusive labor practices. When you buy Fair Trade certified chocolate, you’re buying higher quality cocoa produced using sustainable practices without slave labor that is shade-grown and bird-friendly. Fair Trade chocolate is profitable for farmers and their families. Fair Trade certified and/or Organic 70% or greater cocoa percentage No artificial flavors No coconut, palm, or hydrogenated oils Calorie-for-calorie, I consider chocolate far more satisfying than the equivalent amount of calories from other desserts. Be aware, however, that a standard 3-ounce bar packs a surprising 450 – 500 calories! As a mindful eating practice, see how satisfied you can be with a serving of chocolate that is 200 calories or fewer. I had no idea that chocolate is produced with slave labor until I did the research for this article. Please pass this information along to your chocolate-loving friends. At The Sage Companion Project, February is always Heart Healthy Month. Boomers and Post-50 People know that good eating habits are important, but maintaining them can be tough. We asked our favorite SLIM COACH to talk with us about strategies he uses and recommends to keep a promise for luvin’ your heart with a heart-healthy plan. Here's a special interview with COACH GREG you won't want to miss. SAGE: In your latest book, Coach Yourself Thin, I recall that you mentioned that one of the best ways to reduce saturated and trans fats in your diet is to limit the amount of solid fats — butter, margarine and shortening — you add to food when cooking and serving. When we do use fats, are there one or two you might recommend over others? Could you tell us which foods are heart-friendly and which foods to limit and what about portion size is important to know? Start by thinking about the foods that you make you happy; those that bring you joy, that get you most excited, and that you leave you feeling alive. I’d start there. Then think about eating foods in their freshest and most natural state. If it’s an animal fat, it’s important that the animal was living a healthy and normal life. Animals raised this way are typically found locally and on a small farm (think about how your grandparents did it). And plant foods that are heart healthy are many. Which ones excite you? Avocado on your salad? Tasty green olives? A ripe mango? As for portion, be moderate. SAGE: We’ve heard that eating more fruits and vegetables may help us reduce the amount of high-fat foods, such as meat, cheese and snack foods that are not all that heart-friendly. Do you recommend certain fruits and vegetables? And what fruits and vegetables should we avoid? GREG: I love carrots, bananas, and white potatoes … three foods that are excluded from many diets. I eat them because I love them and feel good when I do. What are the fruits and vegetables that help you feel your best? Personally, I think green leaves are medicine and do my best to eat kale, Swiss chard, and other greens when I can. SAGE: Here at The Sage Companion Project, we know about the role of whole grains as good sources of fiber and that this is a good idea when it comes to heart health. Could you clue us in on some “adventuresome” whole grain alternatives to try? GREG: Tell me which grains work best for you. Start there. Some people feel their best when they have minimal grains in their diet. Others find that a certain portion of brown rice and quinoa leave them feeling good, whereas bread and corn don’t. Ask yourself: “Does this food work for me?” and start paying attention. Be willing to exclude certain grains for a few weeks to see if you notice a difference. SAGE: Do you have a favorite recipe that features one of these grains? SAGE: In your latest book, Coach Yourself Thin, I recall that you mentioned that one of the best ways to reduce saturated and trans fats in your diet is to limit the amount of solid fats — butter, margarine and shortening — you add to food when cooking and serving. When we do use fats, are there one or two you might recommend over others? And I’ve started using avocado oil and think it's another good option. Enjoy! P.S. "Beer and franks eaten with cheer and thanks is healthier than beans and bread eaten with angst and dread!"